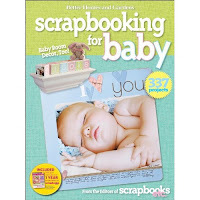 While Scrapbooking for Baby from Better Homes & Gardens may not contain anything new for advanced scrapbookers, the entry level content makes sense for an idea book focused on babies. After all, isn't the birth of a baby often what gets many started in this wonderful hobby? Also, I can honestly say that I desperately wish I had had access to this book when I started scrapbooking so many years ago. The sage advice and tips held within its covers could have saved me from many early 'mistakes'...and probably some money, too!! This section is basically a tutorial for new scrappers on what they'll need to record the highlights of everything baby. It includes guidelines for the core ingredients, how to put them together, tools of the trade, basic techniques and organization. This section includes 17 layouts with ideas covering the discovery, anticipation, fears and more in the months before the baby arrives. This chapter also has a bonus box including numerous tips in dealing with delicate ultrasound pictures. This section also includes 17 layouts with ideas covering everything from recording the first moments in the birthing room to what things cost at the time you baby is born. Also includes tips on taking newborn photos and making unique baby announcements using your supplies. The end of this section offers up a simple formula for a Visitors Album and a Brag Book. This section covers the obvious - first steps, first bath and more - but there are also many other ideas for firsts to cover that you might not have thought of in new and interesting ways. 35 layout samples are included. This chapter includes a simple framework for a great timeline album. The biggest section in the book - boasting 44 layouts - it goes to show that the daily activities are just as important to document as the big events. After all, what seems like mundane routine might be gone altogether tomorrow with a growing child in your house. This section also has some great tips for organizing your photos and making journaling a little less painful and time consuming if you're suffering from writer's block. At the end, the framework for daily life and 1st year albums are featured. Includes 28 layout samples showing you how to "chronicle your little one's developing persona" and the growing bonds with family members. Also includes tips on how to get successful photos of you busy little one. The album featured in this section is a digital one using Epson's Storyteller Kit. There are three versions of the same album included - from super simpler to beautifully embellished - so that you can decide which level is right for you. This is perhaps the most obvious of subjects for most scrapbookers and this section gives you 17 layouts to help you scrap the holidays, birthdays and more. There are also several tips for unique birthday photos included and a 'year of event's album framework using a calendar for its foundation. Includes 8 ideas for super sweet gifts for any baby or new mom. Now that the basics have all been covered, this section offers 8 techniques (with step-by-step instructions) to help you kick it up a notch. Is the birth of a child what prompted you to begin scrapbooking? If not, what did? Random.org will select the winner on Monday. Be sure to come back to find out if you've won!